Across age categories, women in the US are having fewer babies—with one notable exception. The fertility rate in the US fell to a record low for a second straight year in 2017, according to provisional data recently released by the National Center for Health Statistics. That continues a steady decline since in 2008. But one group stood out as an outlier: For women between the ages of 40-44, birth rates actually went up. Women in the developed world are increasingly delaying marriage and postponing childbirth in favor of education and furthering their careers. The new data suggests that applies to women in their 30s as well as women in their 20s. 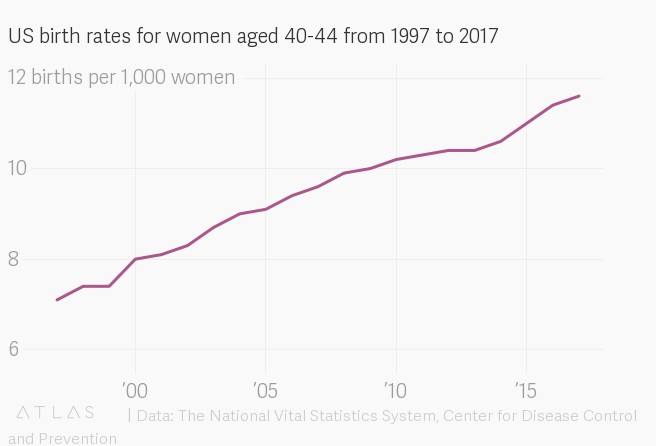 In 2017, the birth rate for US women between the ages of 40-44 was 11.6 births per 1,000 women, which represents a 2% increase from the previous year. By contrast, birth rates for US women between the ages of 30-34 were 100.3 per 1,000 women, a 2% decline from 2016, while birth rates for women ages 35-39 were 52.2 per 1,000 women, down 1%. In other words, American women in their 30s are still having many more children than women in their 40s overall. But women in their 40s are increasingly likely to have kids. This reporting is part of a series supported by a grant from the Bernard van Leer Foundation.